Small city gardens can be some of the most challenging gardens to design but they can also be the most interesting and rewarding to the garden desinger when they see the garden finished. There are a lot of lost corners in city areas which could be developed into wonderful outdoor spaces which merge with the interiors of their houses and extend living spaces. 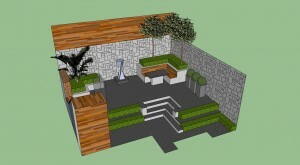 This Small City Garden Design was completed for a city garden close to the centre of Dublin and it makes use of space brilliantly whilst also making a very attractive outdoor space. 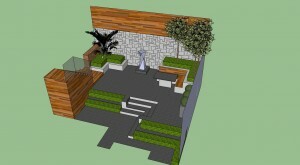 The key garden design ideas in this garden include a built in table, benches and planters plus a very striking piece of garden sculpture positioned centrally in the garden. The garden was also unusual as it could be accessed from stairs entering onto the ground floor or from the doors into rooms in the basement with large windows looking out into the garden on both levels. The views from both these areas therefor had to be considered in the design to ensure that the garden could be enjoyed when viewed from either the inside of the house or when outside. Sometimes we have to sacrifice garden features which some people think are necessary for a garden to be a garden, for instance, the Lawn! All gardens do not have to have a lawn, it can be nice if wanted but it is not necessary in small gardens. Maximising on space and utilising it to the best advantage of the occupants of the house are the most important aims. Minimising on planting can also be considered if a very low maintenance garden is required, however some planting including a few structural plants is necessary to soften the hard lines of the surrounding city landscape. Sculpture is a great addition to a small city garden design. However, sculpture is a very personal choice and must be done not only to suit the space but also to the clients taste. If you love a piece of sculpture you have been party to choosing, then you will really appreciate sitting in the garden and enjoying it. Sometimes small city gardens can be shady and overlooked, however, whether an outdoor space is useful should not be decided based on the amount of direct sunshine it recieves, city gardens are probably mostly used when the sun is already low in the sky, when even the most open gardens may also have lost direct sunlight or when it is already dark. Outdoor lighting can make a city garden look really attractive on a warm summer evening and if you add to this a gas outdoor fire and some screening, you have a really lovely warm atmosphere to enjoy in the evenings.